The CHOOSE function is one of the lookup and reference functions. It is used to return a value from a list of values based on a specified index (position). 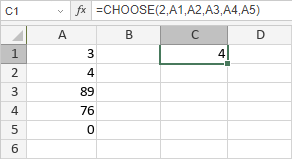 argument-list is the list of values or the selected range of cells you need to analyze.